Auckland Chamber of Commerce CEO, Michael Barnett, can truthfully claim to be ‘fit’ for business. His early start means he is at the gym ahead of his working day, a routine he sees as important for coping physically and mentally with his diverse workload. While that ‘load’ includes steering the vigorous, not-for-profit association in its support of profitable business growth and numerous mentoring and advocacy roles, it also includes keeping on top of a multitude of other industry positions. – What ‘qualifications’ did you bring to the Chamber of Commerce when you took up your role 30 years ago? It wasn’t the qualifications it was the awareness by the Chamber that it was time to change. Change from an organisation that had support from the upper end of town and membership that ‘belonged’ because it was the right thing to do. The SME sector was dominating and there was an expectation that people should not be members just for sake of it – members wanted value and they wanted a voice that could provide them the best platform from which they could operate their businesses. This included anything from talent to infrastructure, policy to local government. Previously, I had a career in manufacturing, distribution, marketing, start up and procurement. – Most people are familiar with the Chamber by name but do you think people (in general) know enough about what it does? No, I don’t believe they do and that’s our toughest role – to tell. On one hand people need to look at the advocating we do and the services we offer including advice, international trade, networking, training and mentoring and then take into account the 1000 people we place into employment with our members each year – disadvantaged youth and migrants. It’s gratifying our members are prepared to give such at risk people a chance. – In general, do you think most SMEs know they can seek mentoring from you? Increasingly, yes, but it takes time and marketing investment. – How successful is the Chamber in working toward youth employment and encouraging young people into career opportunities/growth? Very, it’s one of the things I am proud of instigating. – What do you see as the Chamber’s most important roles? I look at our “WHY “and that is to provide the best platform from which our members can operate. For some it’s help at the start, for others it’s exporting, others infrastructure, others providing a collective voice – it varies. Some just want to grow their businesses through networking. – How much influence does the Chamber have in advocating for businesses with industry bodies? How about when lobbying government regarding business/economic policy? – In your 30 years with the Chamber for has your role changed? My role changes every day with a range of issues that need dealing with on behalf of the business community, the state of the economy, the trade we do or intend doing, the policies we face and the governments we need to work with. – How has the Chamber itself changed/developed over the past 30 years? The Chamber is more than double the size it was 30 years ago. It is a significant property owner and has influence across a wide range of areas and partnerships. – Can you do justice to the many roles you fulfil? Considering you’re also chairman of the Auckland Children’s Santa Parade Trust, the Local Government Forum and the Auckland Business Leaders Group among others, do you ever find time to relax? I operate at a high level, have very talented people many of whom have been with me for well over 10 years. I know what I am good at and I delegate. I don’t do trivia and I am focused on the things I can change or contribute to. However, I do enjoy cycling in summer, have done Round Taupo three times (180km), I love photography and enjoy scenic rather than people but, with family, there are always occasions to capture as memories. – You live south of Auckland and work in the city. How do you deal with the daily traffic grind; can you work glide time? My day starts the same every day – I wake at 4.45am, drive to the Northern Club and go to the gym then start work at 6.45am. Unless I have an after work commitment, I drive home at 4.30pm. I use the time to listen to ZB and catch up on the day – there is no daily grind only time which I make work for me. – How big an impact do the Super City’s transport woes have on its businesses? What dollar figure in lost productivity would you estimate? The cost in productivity is billions. Until we have politicians who are prepared to accelerate their decisions and investment actions, we will have that cost and the chance to catch up on our decades of lack of infrastructure investment will be lost. 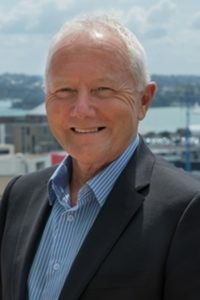 – With in excess of 17,000 homes planned (or underway) in southern Auckland alone, what needs to be done to ensure workers get to work on time? Could improved rail be the answer? The answer will be a mix of road and rail and other innovative ways such as ride sharing and flexible work hours. The biggest problem we have is that we while we know we are growing, we have not made decisions at the pace we needed to so we could manage that growth – we now have growth and catch up. – If you could be Minister of Finance for one day, what would you do and why? Auckland has a $15b shortfall in infrastructure – commit what NZ could afford, and internationally tender the balance as Public Private Partnerships and get the work done. – If you could ask three people living or dead to dinner, who would they be? My father – he died when I was under 40 – he never saw his return on his investment as a father. Leonard Cohen – his poetry and music has been a big part of my life. There are poems I felt he wrote for me (although he obviously didn’t!) but would like to know what were his reason behind the words. Nelson Mandella – I had a two hour lunch with him one day – he was wise and funny.